Retail $8.10 SAVE 23% ! This pin vise has two reversible steel chucks. Four chuck sizes: 0-1.2mm (0-.05"), 0.8-2.0mm (.03-.08"), 1.3-2.4mm (.05-1"), and 1.8-2.9mm (.07-1.1"). 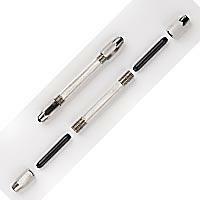 Use with drills, miniature reamers, files, etc. One Double Ended Pin Vise.